Gabriel Garcia Marquez 6 March 1927 17 April 2014 Mexican, Colombian Gabriel Eligio García Luisa Santiaga Márquez T.V Writer, Novelist, Opinion Piece Writer, Actor Novelist, short-story writer, screenwriter and journalist, he was considered one of the most significant authors of the 20th century and one of the best in the Spanish language. In 1972, he was awarded the Neustadt International Prize for Literature and Nobel Prize in Literature in 1982. 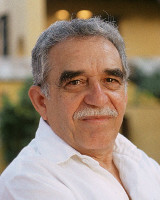 A list of popular gabriel garcia marquez quotes are given below.